To make red layer, pour 1 cup water into 1-quart saucepan. Sprinkle unflavored gelatin over water. Let stand 1 to 2 minutes to soften. Heat over low heat about 5 minutes, stirring constantly, until gelatin is dissolved. Remove from heat. 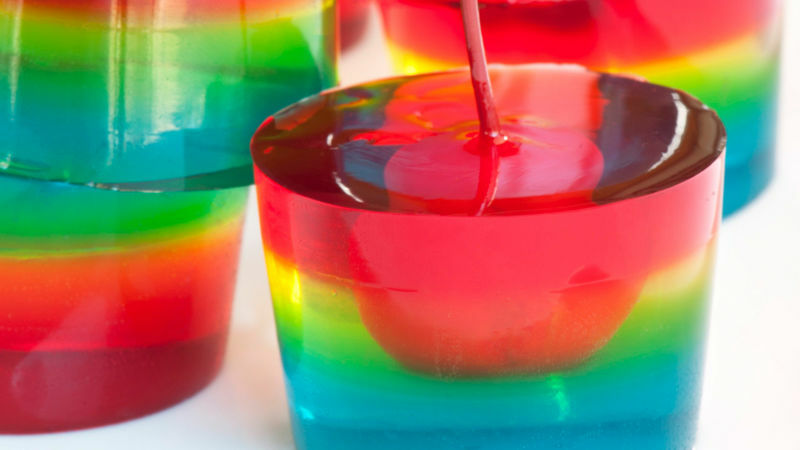 Stir in flavored gelatin until dissolved. Stir in vodka. Pour into 13x9-inch cake pan or 48 flexible silicone mold cups. Refrigerate until fully set, about 1 hour. Repeat to make yellow layer, using yellow layer ingredients. Cool mixture to room temperature. Pour over set red layer. (If garnishing with maraschino cherries, cut bottoms off cherries so they will stand upright, then add them immediately after yellow layer is poured into pan or molds.) Refrigerate until fully set, about 1 hour. To serve, cut pan into 8 rows by 6 rows or desired shapes. Dip pan in warm water, just to rim, 20 to 30 seconds or just until loosened; invert pan onto cookie sheet. Gently unmold if using molds. *We recommend Hangar One, Buddha's Hand citrus-infused vodka, but your favorite will work just fine! If flexible silicone molds are used, prepare the molds with a quick spray or wipe of vegetable oil, then wipe the molds clean with a clean paper towel. This will leave a slight residue to assist in unmolding, but will not affect the taste or appearance of your jelly shots.